Shopify has made its name and accumulated 80,000 businesses as customers by providing a simplified ecommerce and inventory system, but now it’s moving offline. The company is expected to announce a $100 million Series C funding round Thursday led by OMERS Ventures and Insight Venture Partners to provide offline commerce services for businesses. The round also included Bessemer Venture Partners, FirstMark Capital, Georgian Partners, and Felicis Ventures. While Shopify has seen success online, with overall sales across all stores hitting the $1.5 billion mark this year, Finkelstein said that the next challenge is bringing the experience offline. While Shopify has explored similar shopping opportunities before — notably the startup’s Popify brick-and-mortar experience that took place last week in Toronto — the company has been focusing on refining tools for companies who choose to interact with customers in the real world. In August, the company introduced a proprietary point-of-sale (POS) system available via iPad app for a $49 a month fee — complete with an inventory management and a cash register. Finkelstein said that the goal for the POS was developing a program that not only provided “just payments,” but also was simple enough to become a viable option for companies that normally choose older, more expensive POS systems offered by traditional companies like IBM and MICROS. “Even if you grow to be a $20, $30 or $50 million shop, you should never have to leave our platform,” Finkelstein said. 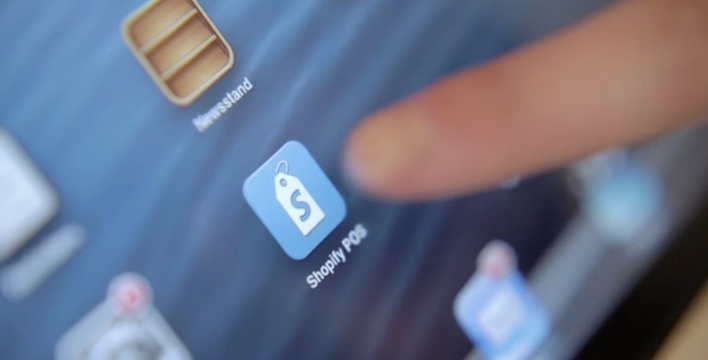 Finkelstein said that the biggest selling point that Shopify’s POS system is a united platform that merges both online and offline sales. Not only would businesses be able to see their inventory both in store and online, but all sales would be tracked in real time. In addition, Finkelstein explains that in time, the company hopes to engage small businesses that don’t have online presences, using the POS system to entice them to establish an online shop. “They may decide to hit a button, and all of a sudden they have an online store created for them,” Finkelstein said. In order to make the complete shift to ecommerce, Finkelstein said that the company is focusing on hiring the right personnel. He explained that while the company has 320 current employees across three offices in Canada, the company plans on having more than 500 by the end of next year. Keep in mind that many Shopify merchants may also have day jobs and the revenue from a website may just be extra on top of their regular income. I also can’t figure out for the life of me why people say Shopify is expensive. I mean do any of these people know how much pos software for a retail store costs? It can be thousands of dollars per month. I think Shopify is incredibly affordable. USD 1.5 B for 80.000 e-merchants, that is an annual sales figure per merchant of USD 18.750. I.e. the very small merchants who churn a lot (die young as they remain unprofitable), and spend very little on extra addons. A business proposal that seems extremly over priced as a business for me. A fair comment but the key is “average” per merchant. I’m certain they all have churn (Volution, Big Commerce, Etsy and others) and it will take a dozen (or more) that never make a sale to offset one that is doing 100k+. Of course, as a private company they don’t have to share that sort of thing but the VCs that are dropping all that money into Shopify know the numbers and have come to certain conclusions. The common complaint I see in comments on Shopify involves the “extremly overpriced” nature of the service. But for the life of me I can’t understand why $30/month or $360/year is such a barrier. If the business can’t afford $30/month it isn’t a business. I’m sure a large percentage of the 80,000 merchants have $0 in sales. The average sale per merchant is really not that important. The important number is total sales overall because that generates the total profits that the VCs care about.